Now that it is imminently apparent that we are leaving Cambodia – perhaps for good, perhaps not – I find myself ruminating on the last 3.5 years. My pals Mr. Key (l) and Tony yuk it up, lubed by a few beers at our going away party. 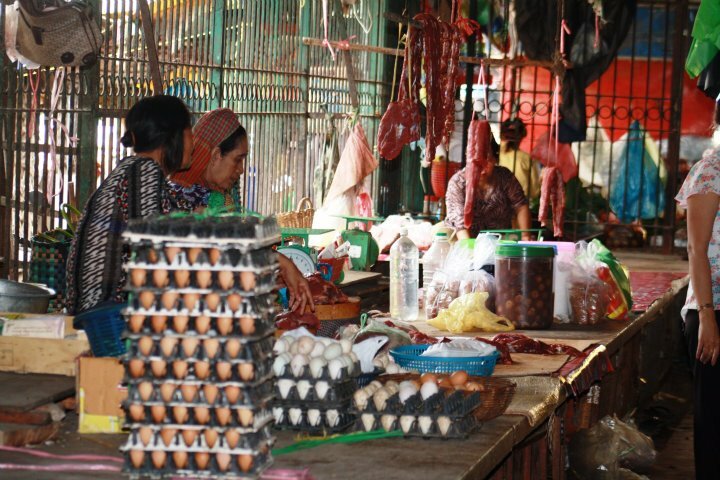 Meat suspended from a hook in the sultry mid-day heat; eggs stacked and ready for sale. 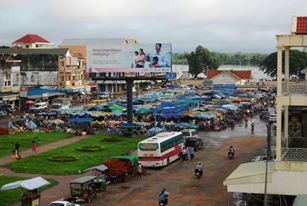 Typical Cambodian market. Living in a place where the water we brush our teeth with is drunk at one’s own risk, where it’s wise to look all four ways before stepping off the curb to cross the street, and where “schedule” is a euphemism for “someone’s vague idea of timing” has at once stimulated, intrigued, frustrated, titillated, amused and infuriated me. It has also messed with my sense of priorities, forcing me to re-wire my Type A personality into a mellower, more accepting kind of guy. I’ve come to like the chaos of living in a place like Cambodia. The unpredictability, the wackiness, the “can you friggin’ believe this?” moments that happen every day. Every dining experience in a Khmer restaurant is a hit or miss experience. Many times our first choice will elicit “ott mien” (no have) with a big smile from the waiter. Always prepared for this inevitability, I normally have one or two backup choices and am prepared to counter with my own smile and selection #2. Or #3. Or #4. Mien? Mien. I was shocked when, in the middle of presenting to a roomful of NGO leaders, a presenter stopped to answer his blaring cell phone and proceeded to have a lengthy conversation, punctuated by the typical “baat, baat, baat” responses (“yeah, yeah, yeah”) that one hears every day. Every town centers around a public market. This one is in Stung Treng. But you get used to things running contrary to what you find normal and comfortable. Then it amuses you. Then you kind of look forward to it. Most of the time, it’s like English translations in Chinese restaurants: Extremely unpredictable and amusing as hell. But I was pretty ticked off when we showed up at our travel agent’s office Sunday morning at 7:15 as instructed to be picked up for our 7:30 bus to Mondulkiri, only to learn that the bus had left at 6:30. I was less than thrilled that we had to scramble across town and book a ticket on another much slower bus to one of Cambodia’s remotest provinces. I wasn’t thrill happy that instead of a 5.5-hour ride we wound up ambling along with countless stops peppered with pickups and drop-offs, wrapping up the epic voyage after a cool 9.5 hours. But the reward of seeing my smiling friend Sarath waiting by the side of the road – where he had sat, patiently, for over an hour as the bus tortoised along – more than erased the journey’s challenge. I’ve come to love the mess of life in a “developing” country, where Cambodia’s motto of “The Kingdom of Wonder” is often appropriately amended to “The Kingdom of I Wonder” but where life is somehow simpler, gentler, easier. Fruit is always in abudance…every day. Here, we get foot massages for $5 an hour and have access to every cuisine imaginable for a fraction of the price, yet can still fall prey to a tainted rice snack at a roadside bus stop that leaves us both scrambling for the Imodium. I have had Dengue fever twice, Malaria once, and am pretty much on a first-name basis with the folks at the International SOS clinic who process my blood tests and stool samples as routinely as most cafes handle coffee orders. Like the insanely bad drivers who populate the roads here, gastrointestinal disorders are facts of life in this region. Unlike salmonella and giardia, however, the spiritless pinheads behind Cambodia’s wheels are benign assassins, mindlessly scanning their iPhones while the iPod player blasts western rap music and both TV screens installed in the backs of the front seats play western cartoons – all at the highest volume imaginable. Noise seems an antidote to the madness here. Weddings, funerals, holidays, birthday parties – you name it. Get a bunch of people together, erect a tent that blocks the street, stack up a bunch of woofers and tweeters and power up the sound system to entertain neighbors within the six adjacent blocks. Best part of all: the fun gets underway just before daybreak, usually with some guy blowing into a microphone at 4:30 a.m. and repeating “hello…hello…” until everyone within miles is wide awake. 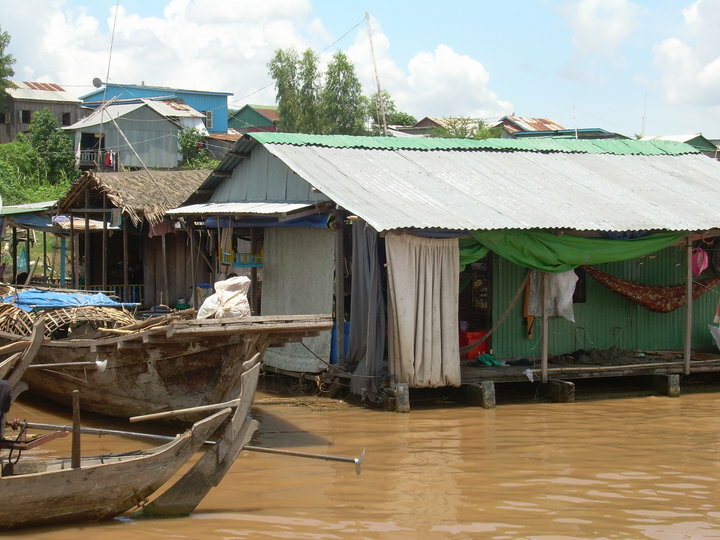 This floating Vietnamese village is typical of Cambodia’s waterways. But I like all this craziness. I like that tuk tuk drivers will say “yeah, yeah, yeah” when you clamber into their ride and give them an address. Even if you do so in their native tongue, there’s a decent chance that they’ll fire up the motorbike and head off in the wrong direction then circle madly until they find a fellow driver to ask for directions. Two drivers often will become three, then four, until it’s an all-out babbling tuk tuk driver convention with confusion the main order of business. It’s all about securing the fare, destination and timetable be damned. I love that Cambodian waiters will glue themselves to your shoulder immediately after you sit down, apparently expecting you to have decided on your food order before you enter the restaurant. I find comfort in knowing that a meal ordered by a Khmer friend will invariably include a noodle dish, a soup, an enormous and endless cauldron of rice, some nondescript meat and vegetable dish to be picked over and mostly bypassed and a fire-roasted snakehead murrell fish with a bunch of lemongrass stalks stuck down its gullet. I have learned that “no” often means “yes” here, and that a smile is either a genuine display of pleasure or a sign of intense discomfort. 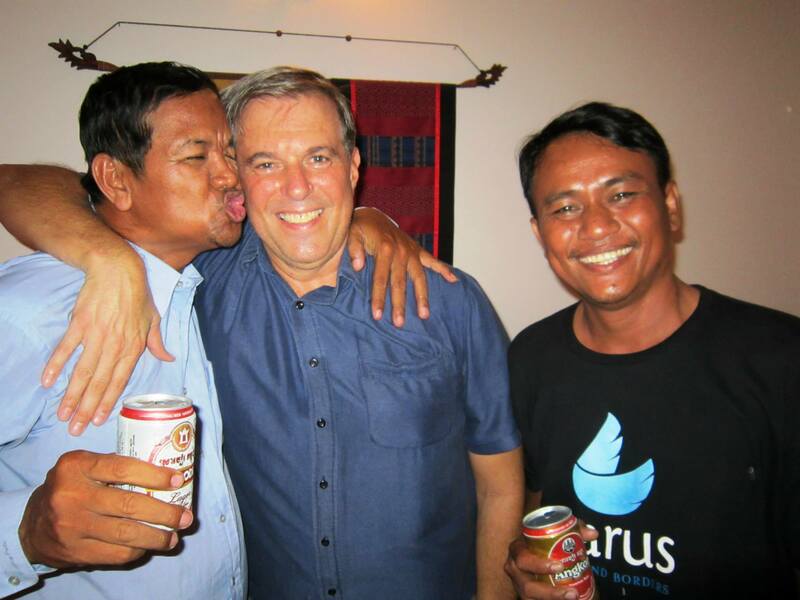 I long ago learned that the “Oh, you speak Khmer so good!” compliments routinely thrown our way may be intended to earn our favor – and thus perhaps a paycheck – but it’s also genuine appreciation of foreigners who actually try to speak this mind-numbing language. I love being waved at by naked children running along the dusty roads of Kandal Province as I cycle past. My heart fills with pride and wonder when an adult smiles a toothy grin and asks me to sit for a spell and just talk in Khmer until I run out of linguistic gas and beat a retreat. 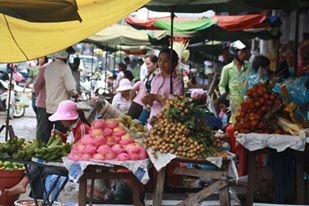 I feel all cozy and comfy when the fruit and vegetable vendors in Ptsar Kandal see me coming, smile, and reach for a handful of extra chilies, garlic or spring onions to tuck into my bag when I am done selecting the day’s purchase. All these things feel so much like normalcy to me now. So familiar. So much like home. Home is never far away.. You can always return there after your next adventure. Wonderful description of Cambodia. I almost smell it! Those of us who have traveled with you through your visuals and writings feel your heartstrings pulling but look forward to what is next around the bend of your dusty roads. Safe travels. Thanks, Anneliz. It’s been a helluva ride, no question. Onward. Fantastic compilation of, I can feel the energy of Cambodia in your words. Safe travels. Oh how I remember it all especially as I sit in such a squeaky clean world back here in the states. But I don’t miss the range rovers honking at me I must admit.